If you are arriving at Split Airport take a taxi or Airport Bus to the Split Ferry port which takes aprox. 35 minutes. Ferry from Split to Supetar takes another 45 minutes. 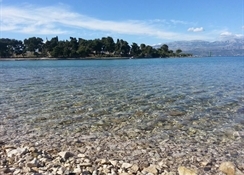 From Supetar port you can walk 15 minutes or call hotel for transfer. Taxis or minivans are also available. Established in 2003, this charming, small boutique hotel comprises a total of 23 rooms spread over three floors, a garden and a terrace as well as including personnel from England and Spain. The air-conditioned hotel also features a garden café with a bar in the shade of majestic palms and olive trees as well as an excellent restaurant. Guests are welcomed in the foyer with 24-hour reception desk, a hotel safe, a currency exchange facility and a cloakroom. Moreover, guests may make use of the conference facilities, the room and laundry services and the bicycle hire. Parking is available on the street opposite the hotel (no charge).The originally designed rooms are all equipped with an en suite bathroom with hairdryer, a direct dial telephone, satellite/ cable TV, Internet access and a radio. A double or king-size bed, a hire safe, and either a balcony or terrace is also included in all accommodation units as standard. The air conditioning and heating are individually adjustable.